If you love to sew chances are you have a pretty good supply of scraps. In this workshop we will have some discussion about cutting/storing scraps (there is no right or wrong here it is just interesting to hear what others do). Then I will share some ideas starting with ideas for some larger items from remnants for baby quilts, string quilt, table runner. Next we will move on to things to make with smaller scraps and keep going all the way down to making fabric “pizza” from snippets. Supply List : The basics – you will need basic cutting and sewing supplies including a sewing machine. 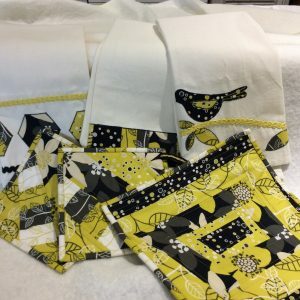 The fun part – you can bring some larger pieces in case you want to make a baby quilt or table runner. It is a good idea to bring some strips 1 1/2″ – 3″ wide and 10″ to WOF wide. The “making fabric” technique starts with strips. It is your choice whether they are coordinated or truly scrappy. Also you will have a chance to use some small scraps too so bring some along.